Sometimes, after a night as dark and dire as Sunday night was, you'll latch onto anything to buoy you up and give you hope. 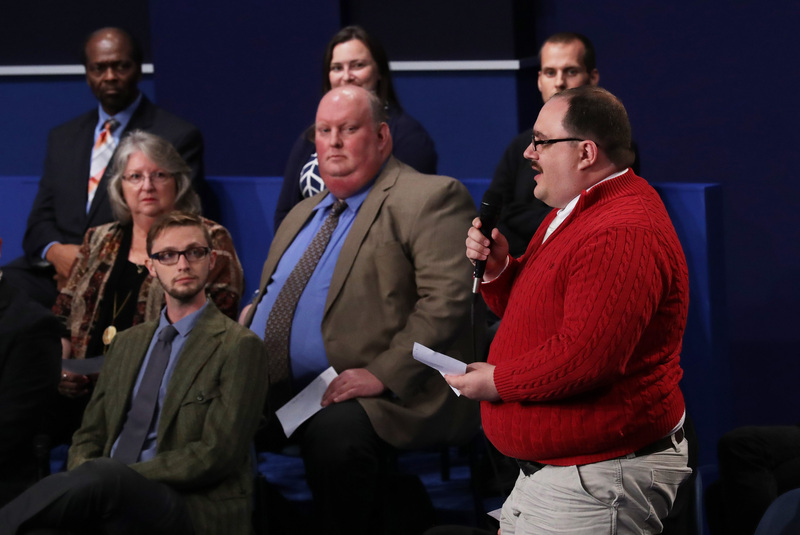 Second debate question-asker and national charmer Ken Bone appeared on CNN on Monday morning, and was asked about his suddenly-iconic red sweater, which he wore to the debate last night and was sporting proudly on the cable news channel this morning. "I had a really nice olive suit that I love a great deal and my mother would have been very proud to see me wearing on television," Bone said. "But apparently I've gained about thirty pounds, and when I went to get in my car the morning of the debate, I split the seat of my pants all the way open." He went on to explain that, "the red sweater is plan B, and I'm glad it worked out." In a night that held little to feel good about and plenty to feel miserable about, Bone, and his bright red sweater gave a lift to nation that really needed it. In no time at all, the internet embraced him, where he trended on twitter and found himself the subject of a wealth of memes. "I want Ken Bone to wrap that beautiful red cableknit sweater of his around our divided nation," tweeted Newsday writer Marc Carig. "Only his warmth can save us now." Despite his charm and the fact that he loves his mom, many were disappointed to hear in the same interview that Bone is still an undecided voter, even after last night's slug-fest. "At points during the debate, it almost felt like watching mom and dad fight," Bone said. What poor Ken may not know is that as quickly as the internet embraces you, it can turn on you, and Monday morning, it seemed like that process had already begun. Ken Bone, we barely knew ye.